Humanitarian groups in Juneau are bustling to help anyone in need with Thanksgiving preparations. Social service agencies also are reaching out to assist with people displaced by the recent Gastineau Apartments fire. Thanksgiving preparations will wind down after this weekend, just in time for the organizations to open their doors to Christmas donations and volunteers. Organizations and individuals across the city are preparing food boxes for families in need. The Salvation Army will host a community meal from 11:30 to 2:30 on Thanksgiving Day at the Hanger on the Wharf. Captain Donald Warner says nearly 500 people attended last year. The Southeast Alaska Food Bank supplements local agencies’ food basket preparations. On Saturdays the food bank also opens up to families and individuals who need food, toiletries, cleaning supplies or pet food. Manager Darren Adams said last Saturday was particularly busy, with 70 people stopping by, each leaving with an average of about 25 pounds of goods. “A lot of people are feeling the pinch of how to pay your bills and provide food and make it all work,” Adams says. The Juneau branch of the nonprofit organization Saint Vincent de Paul has been providing food baskets for about 20 years. General Manager Dan Austin says the organization expected to give out up to 450 food baskets this week. Austin says in the past St. Vincent’s has supplied about 300 Thanksgiving boxes, and has not been able to reach everyone in need. Glory Hole Executive director Mariya Lovishchuk says more people are looking for shelter now than in previous years, because the homeless population in Juneau is aging, and many are having trouble with the physical strain of constantly moving camp. The Glory Hole and Salvation Army say Juneau homeless residents spend a lot of time on their feet, and could use socks. 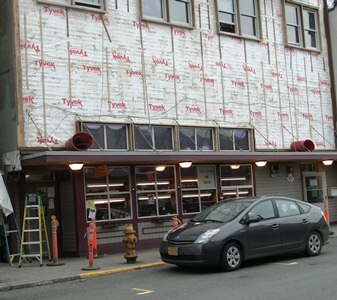 Major work is being done on Juneau’s Glory Hole homeless shelter to repair rot damage. The shelter is giving out about 200 food baskets to Juneau’s needy. St. Vincent de Paul’s expects to provide more than 400 baskets this Thanksgiving. The Glory Hole is selling tamales this week to repair rot damage to the shelter on South Franklin Street. Glory Hole employee Eleanor Gallendo travelled to California for ingredients, and restaurants El Sombrero and El Zarape worked with volunteers to make the tamales. In the next couple of weeks, the shelter will finish renovations – the unexpected repairs cost $10,000. Lovishchuk says the shelter will provide about 200 Thanksgiving boxes to families in need. Each box contains a turkey and all the trimmings, as well as pie. 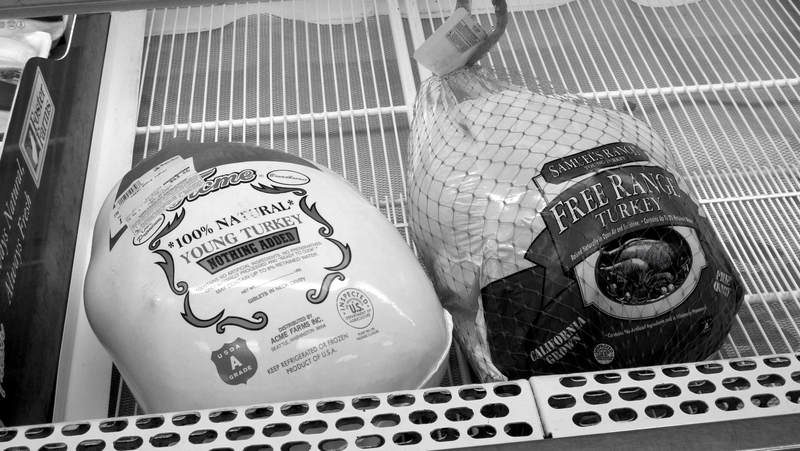 A week ago, the Glory Hole had only two turkeys on hand, but since then donations have poured in to fill the shelter’s freezer. Some victims of the Gastineau Apartments fire are also still seeking aid and permanent housing at the beginning of this holiday season. St. Vincent’s Austin says 43 households were displaced by the fire. Austin says the Juneau Homeless Coalition, a collaboration of 21 agencies that provides rental assistance, is seeking housing for fire victims. Austin says St. Vincent de Paul converted a common space to emergency housing at the Mendenhall Valley shelter, and some households found housing at Gruening Park Apartments. The Christmas season is the next hurdle for Juneau families in need. Both Salvation Army and St. Vincent de Paul are offering “Adopt a Family” services, allowing Juneau residents to provide Christmas presents for children. The Salvation Army’s Santas will begin ringing their bells across town on Friday.